This spring, with the Canucks' Stanley Cup run, has been troublesome for extracurricular activities (particularly sports). You see, the Nux games seem to fall on the nights I play my games. That has resulted in postponements, at least for softball. However, that has not been the same for hockey. It appears that the league does not want to reschedule games. Originally, I had given Gadget Girl the heads up that I probably would be missing our next game since it fell on the same night as game 5. Well, apparently she thought I was joking and was taken aback when I confirmed I wasn't playing the game. With me being the goa lie, that didn't sit well with her and suddenly, I briefly considered going for police protection. At the end of the day, I decided to play since the team comes first (or the fact I'd be traded for a bag of pucks if I didn't...). Since our game started at 6:15pm, we were hoping to catch the end of the Nux game when we were done. Of course, with our luck, the game went into a shootout requiring 9 shooters deep per side. After that, rather than doing it all over again, the ref declared it a tie and we hightailed it the locker room to get out of our gear. We ultimately made it upstairs to witness the win that would put the Nux on the brink of their first ever Stanley Cup . With the game out of the way, we then put our attention towards good eats. However, some wanted to go to Earl's... Uh... That was my biggest nightmare! Chain restaurant food? I had to do a heck of a sales job to convince them to head to Campagnolo Roma instead. I reasoned that we could go to a chain restaurant anytime; but honestly, for the same price - how about something more distinctive? So while on our drive on McGill off of the 2nd Narrows, there were people cheering on the street and as I neared a group, I t hought it looked like there were 2 guys without clothing... Ewww... Why do the people who shouldn't be naked expose themselves??? WTF? 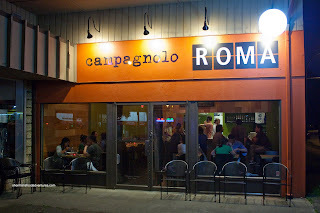 Okay, let's focus on the restaurant now... Campagnolo Roma is the newest venture of the Campagnolo/Refuel group. 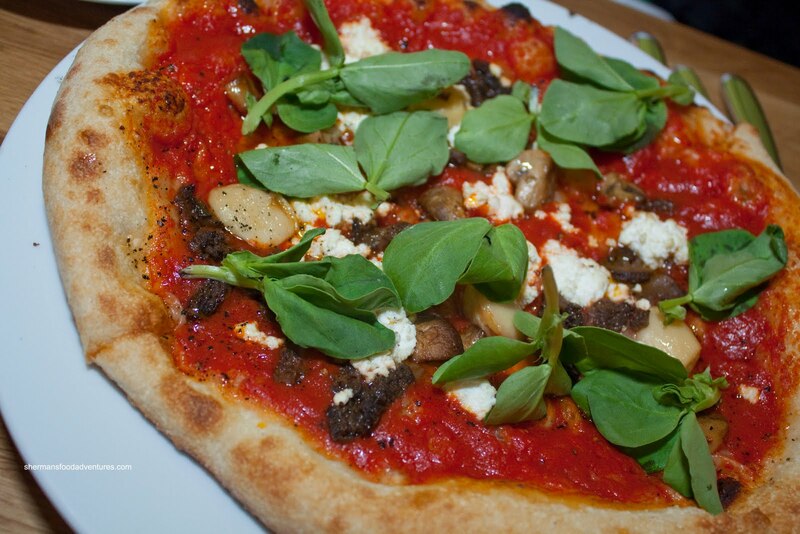 Casual, inexpensive and unpretentious, this little place doesn't take reservations. Knowing how everyone else were partying Downtown, we got a table practically right away. 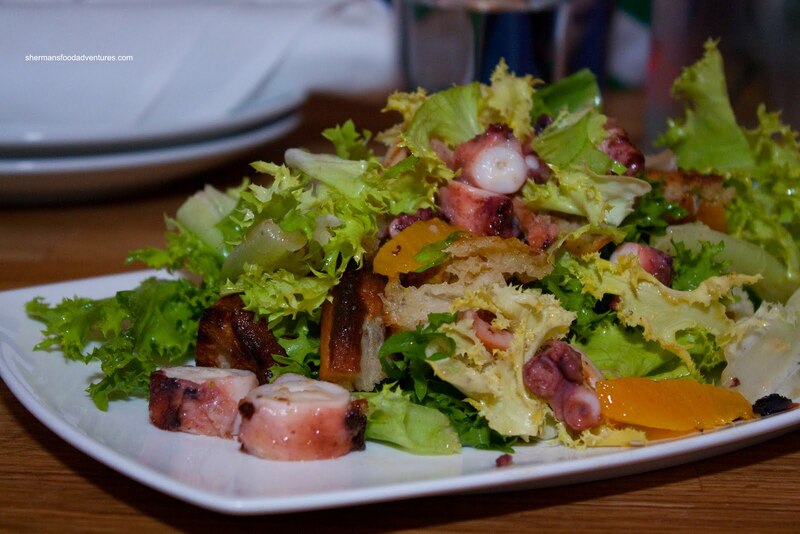 I started with a Local Octopus Salad consisting of endivia, charred bread and red wine vinegar. With just the right amount of chew whil e not tough, this was as perfect as octopus could be. I thought that there was just enough vinaigrette and the crispy bread was a nice textural addition. 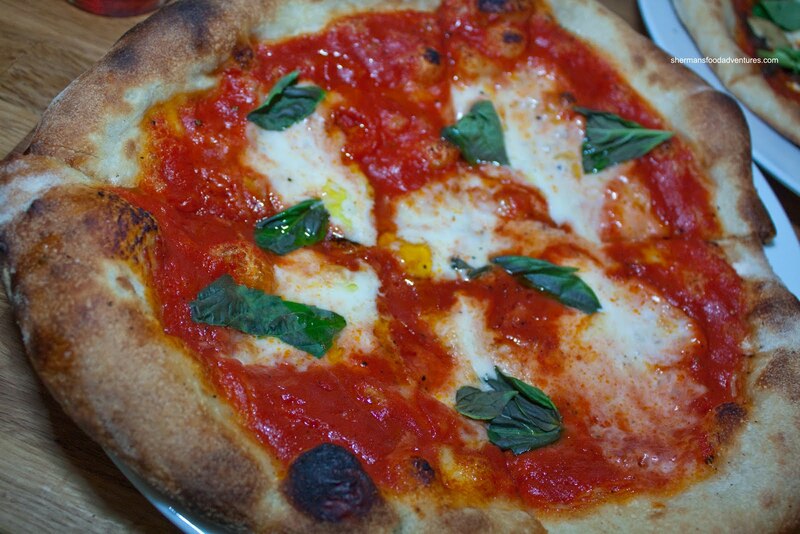 For my main, I had the classic Pizza Margherita with fior di latte, tomato sauce and basil. For not being an actual pizzeria, I thought this was quite good. The crust was crispy and chewy with only a small part of the centre being soft. 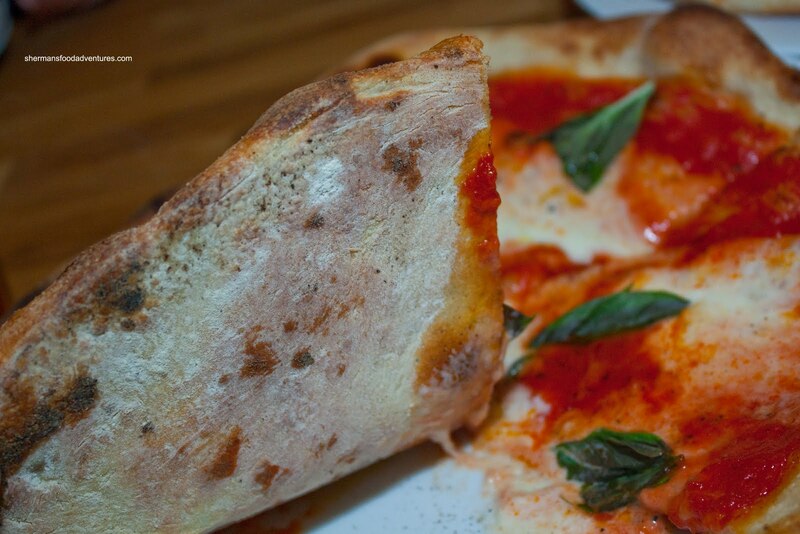 The best part of the pizza was the tasty tomato sauce. 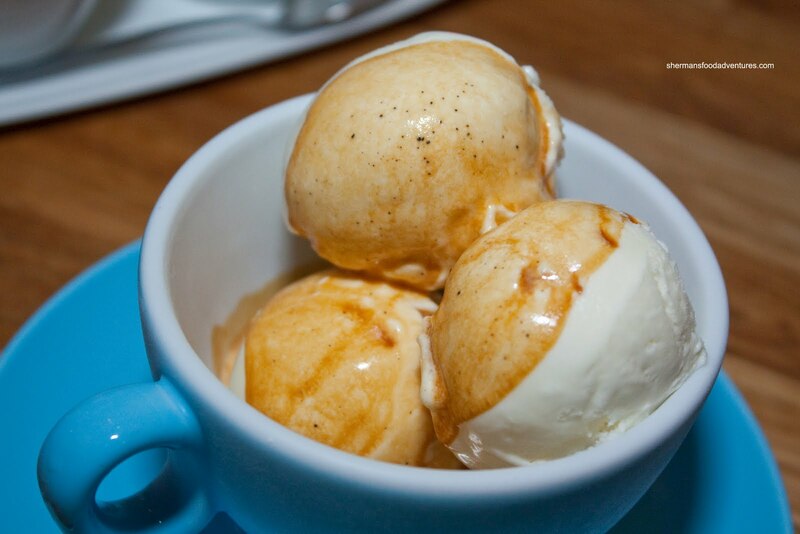 It was well-balanced between being sweet, salty and tangy. I would've preferred that the basil not be "cooked" since it wasn't that not iceable. Sweet Tooth and Emilicious shared a Funghi Pizza which added morels, button mushrooms, ricotta, roasted garlic and greens. This was also very good with plenty of earthiness and the sweet flavour of roasted garlic. Emilicious particularly liked the thin and tasty crust (perfect ratio of crust to topping) as well as the ample fresh basil on top. They also shared the Spaghetti with garlic, peperoncini, spot prawns (which Gadget Girl had as well) and the consensus was that it was okay. 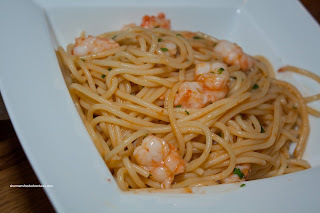 The spaghetti itself was al dente while the prawns were fresh and cooked properly. However, they all felt that the pasta could've stood for more flavour. Not that it wasnt seasoned enough; rather, there wasn't much in the way of distinctive flavour, particularly from the prawns. Mr. Blueberry and Milhouse both had the Cannelloni al Forno with Swiss chard, pork sausage, garlic conserva. The one thing that stood out about this dish was the ample amount of flavourful cheese baked on top. In fact, the flavour was so prominent, the rest of the ingredients were somewhat overwhelmed. It wasn't necessary a bad thing though since they both enjoyed it very much. They noted that the filling was not very dense due to the large amount of Swiss chard. 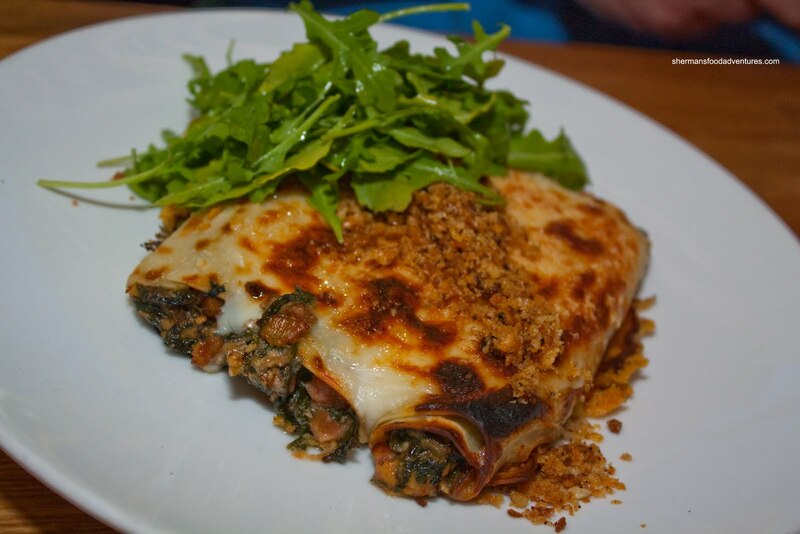 With what looked like fried pancetta on top, it was crispy and flavourful which gave some firmness to offset the soft cannelloni. 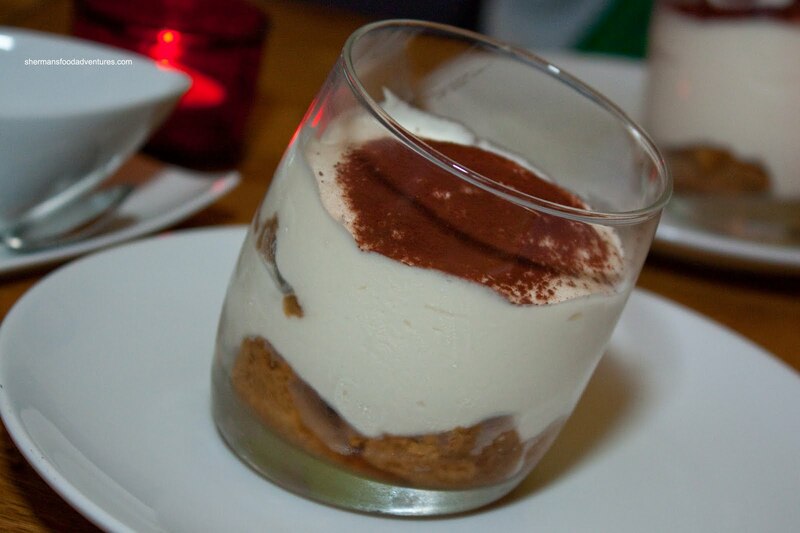 As expected, Sweet Tooth went for dessert in the form of the Tiramisu. We all thought it was very creamy and smooth. Emilicious thought it was a nice, light way to end the meal. Excellent presentation in the tilted glass to show layering of marscapone and lady fingers drenched in frangelico. One of the best tiramisu's she's tasted. Milhouse had the Affugato. He enjoyed the dessert despite its simplicity. It wasn't fancy since it w as essentially espresso poured over vanilla gelato. Bottom line is that Campagnolo Roma isn't really all that fancy really. The pleasing decor impressed Emilicious as she loved the accent wood paneling that extended from the wall to the ceiling; also the pistachio green, textured wall treatment complimented the wood used... Very simple yet sophisticated. 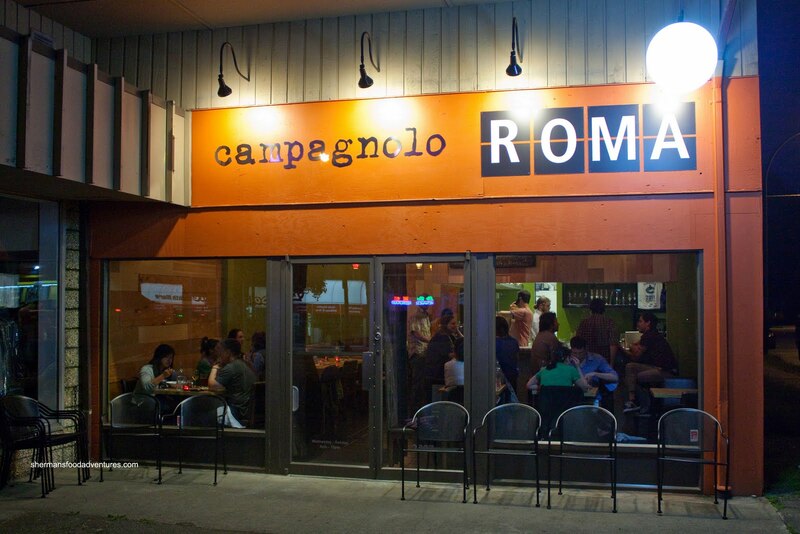 This perfectly describes Campagnolo Roma which features a focused menu, good value and generally well-executed food. wow you eat out a lot! If I ate out so often I would weigh 300 pounds. I love to eat and your blog is definitely a go to blog when looking for places to eat in Vancouver :) Am glad I found it. Food looks good at Campagnolo esp the octopus salad yumm. @Brownie Thanks! Yah, luckily I play lots of sports, otherwise I would be 300+ lbs! Yes, the octopus salad was very good!